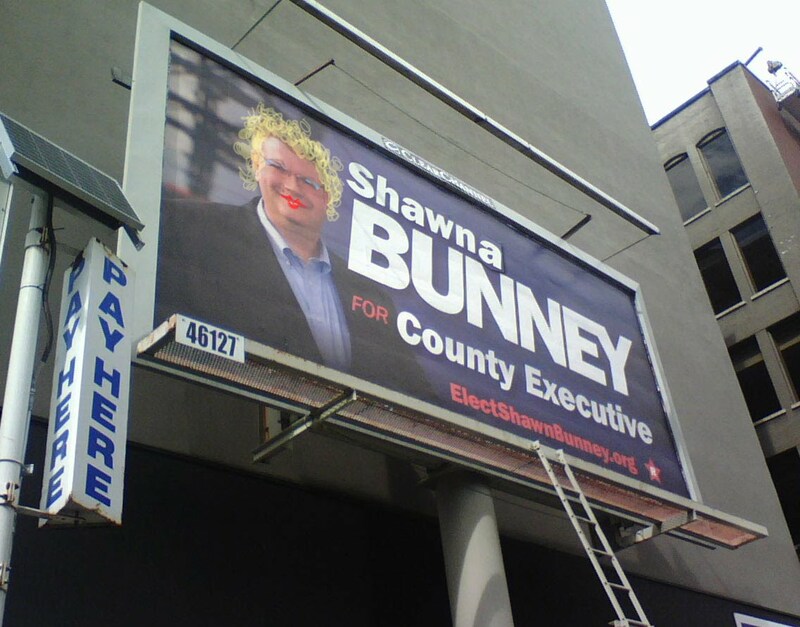 in July of 2008 Shawn Bunney stood up for traditional family values of wholesomely keeping homosexuals in the public restrooms where the great republican god intended. My close personal friends of the Tacoma Cartoonist Society Underground found Mr. Bunney's lackluster clear channel campaign signs wanting of key ingredients necessary to driving the aforementioned values home in a fabulous new message re-branding that will in essence 'speak' to blah blah marketing drivel goes here. by Crenshaw Sepulveda on 7/13/2008 @ 6:30pm I'm glad you clarified this, I thought it was an advertisement for the new Madonna album. by Mofo from the Hood on 7/13/2008 @ 7:04pm Hey, graffiti with commentary AND no public expense for virtual property damage. This almost tops your chalk drawing of Lonergan the Christian as a focal point at a homosexual carnival. Stay cool. Stay in the light. by escaping slave on 7/13/2008 @ 10:05pm You should have put the cartoon speaking bubble next to his mouth: 5 dolla' - me love you long time. by NineInchNachos on 7/13/2008 @ 10:09pm ha! by NineInchNachos on 7/13/2008 @ 10:11pm I think the "pay here" sign fulfills that metaphor in a more subtle tone. Maybe even subconsciously... subliminal. by deeble interactive on 7/13/2008 @ 10:22pm Mr. Anderson, you seriously need to get a life. Bunney is atleast trying to do something about the pierce county voter fraud problem and also cut back on big government spending. And I don't appreciate you making jest about the very real problem of homosexuality. by NineInchNachos on 7/13/2008 @ 10:30pm goddamnit i'm so sick of your friggin EBOOK SPAM! You're worse than spencer!!! !